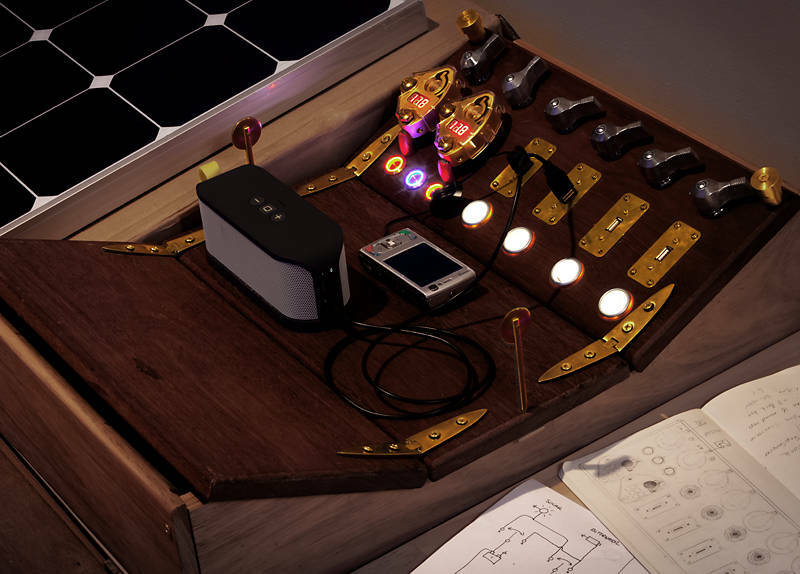 I have been building a Steam Punk styled Solar Controller for our van since we moved to our house in Queensland two months ago. It is made from recycled antique hinges holding together three blue elm wood chopping boards. It allows you to direct power from a solar panel to a deep cycle battery. This can then charge my camera battery and power my laptop. I can then shoot, process and upload to the internet with 100% solar power resulting in Fossil Free Photos next time I am on the road in Australia. The next job will be to attach the new 100 watt solar panel to the roof of our van. Until then there is enough light coming through the window to power our music system. A couple of questions. What are the numbers being generated from? And have you got steam punk enabled USB charging ports there? Great, it could be straight off the set of Dr Who and it works too! The brass USB ports are Land Rover accessories from the UK. The numbers are the voltages of each battery. The volt meters were designed to fit directly onto a car battery so I attached terminals to the board.